Lightning McQueen is forced to reevaluate his future as a racer when the newer, younger crop of high tech cars start to out-perform him. "Cars 3" is the latest installment in Pixar's lowest rated franchise. It is directed by Brian Fee in his directorial debut. Owen Wilson returns as the voice of Lightning McQueen, who also returns to being the central focus in this third installment. Larry the Cable Guy also returns to reprise his role as Mater, though this time around, his screen time is massively reduced, thank god. McQueen has been at the top of the mountain for a while as the best racer in the world. Now, a cocky young upstart rookie named Jackson Storm, voiced by Armie Hammer (which of these two awesome names sounds more superhero-y? ), starts to overtake McQueen, who is beginning to fade as his career seems to be winding to a close. New to the cast are Cristela Alonzo as Cruz Ramirez, a high tech trainer responsible for ensuring Lightning's comeback, Nathan Fillion as Sterling, the wealthy business car that buys the company Rusteez (McQueen's longtime sponsor), and Chris Cooper as Smokey, the grizzled old trainer responsible for teaching the late Doc Hudson since the days of dirt track racing. When Disney/Pixar announced they would be making "Cars 3," we were a bit surprised, especially considering "Cars 2" holds the distinction of being the only Pixar movie with a splat rating on Rotten Tomatoes. Maybe the company was looking for a way to apologize for making Mater the main focus of that wacky spy film with little resemblance to the original "Cars." Everyone involved in this third entry in the series are clearly looking to get back to the roots of the franchise. The first installment was about Lightning McQueen as a young rookie who had to learn respect for veteran racers while gaining an appreciation for quaint, small town America. Now, McQueen is the veteran racer who is losing his ability to keep up with the competition. He must try to regain his mojo by training in quaint, small town America. The very first teaser trailer for "Cars 3" showed Lightning McQueen slowly crashing in a very dramatic fashion. It certainly piqued our interested, and we thought of many possibilities where the filmmaker may go with this third installment. The reality of the situation is this premise really doesn't go much of anywhere. The crash is a small footnote in a much larger underdog story as McQueen must claw his way back to the top of his game and prove to everyone he's not just some senior ol' timer who values naps more than racing. McQueen is forced to train with Cruz, who wants to get him back into tip top shape slowly and steadily from the ground up, mentally and physically. Of course, McQueen has to mansplain to her why his way of doing things is better and fight her at every turn, but we digress. Cruz obviously has baggage of her own, and the two have to come to an understanding with one another in order to finally become the best versions of themselves....or something like that, we almost nodded off, so it's hard to tell. "Cars 3" didn't really grip us. Like all Pixar films, it is very well animated and it has its heart in the right place in a few instances, but overall, this movie is extremely bland. It lacks any real emotional punch. Even Owen Wilson and Larry the Cable Guy's voice overs sound tedious and uninspired, though newcomers Alonzo and Hammer do give excellent vocal performances. We found ourselves quite bored for long stretches of its run time, and even some of the kids in the audience looked at their phones from time to time. All of this comes before the ending, which to us is expected, dishonest, and unearned, on top of being opposite of the message it is trying to convey. 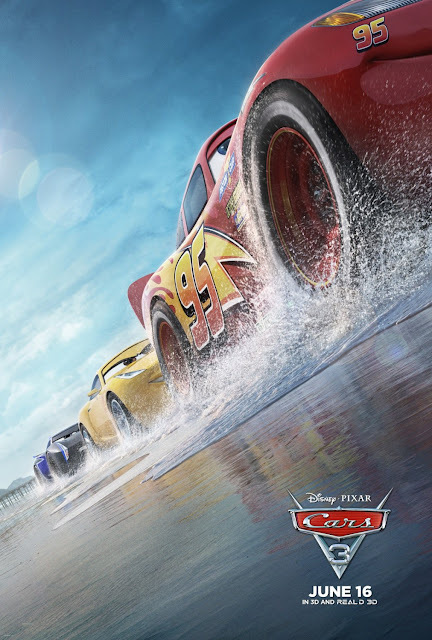 In the end, the best thing we can say about "Cars 3" is at least it's not "Cars 2." We wish Pixar would go back to taking bold, interesting risks to make bold, interesting films instead of playing it safe for the sake of selling merchandise.